Discussion in 'Headline News' started by Mel O'Drama, Apr 7, 2017. I wouldn't want someone vaping around me on a train, in a lift, in a car, in a restaurant or coffee shop, queuing at the supermarket or any other confined space. Agreed. Although I'd like the option for free-to-smoke bars and restaurants. I don't like it when they take that freedom away. Then it's not freedom anymore. Yes, but I meant that non-smokers shouldn't have to be exposed to them in communal areas. Exactly how much air do you need? Many amusement parks don't even allow e-smoking in open air, it's just never enough for the non-smokers. Is it really the physical discomfort, or is it just the very idea that someone would have the nerve to light a cigarette? It's about keeping the market open for a very profitable business. Addiction. And if a non-smoker buys an e-cigarette and gets addicted to nicotine then that's his or her own responsibility. To smoke or vape is the obvious intention when you buy that stuff. It's not like someone would accidentally buy that thing and then accidentally use it and then accidentally become addicted. Funnily enough, your first question is the one that I'd want to ask vapers. The other day I was shrouded in a fine fragrant mist while walking down the street. I couldn't initially see the source and then realised it was billowing from the window of a car parked on the other side of the road where someone was vaping. The idea of being confronted with that - or several of them - in a confined area horrifies me. The open air thing is a grey area for me. I don't like being around it but then if I'm outdoors chances are I'm also breathing in a hundred and one other pollutants from vehicles, factories and the like. So I accept I'm going to be around it. But I think it needs to be regulated in certain outdoor places, such as outdoor seating areas for restaurants, pubs and coffee shops, perhaps with designated areas so others can enjoy their food. It's definitely physical discomfort for me around smoking and vaping. It's a choice between breathing in something I don't want to or holding my breath for extended periods of time. Yes. You're absolutely right about that, Willie. But I think it's also a concern that vaping is something of a trend, with specific shops popping up all over the place and all kinds of exotic flavours. Some non-smokers - mostly impressionable young people - will find it intriguing, enticing and accessible in a way that smoking isn't permitted to be anymore. Of course it's people's responsibility if they choose to pick up an e-cig. But the image that's marketed (by people who need people to stay or become dependent) and the message that they are a safe option isn't helpful. The other day I was shrouded in a fine fragrant mist while walking down the street. I think that was your cue to spontaneously burst into disco dancing, à la Mel O'Mia The Musical. Obviously you never received the script. My apologies for the confusion! Another (not so unexpected) side-effect of the whole smoking issue is smoking in the media, e.g. movies and tv-series. Back in the 70s and most part of the 80s (well, in Europe anyway) actors smoked a lot on-screen, and not necessarily because the script required it. I don't think anyone noticed it, (I certainly didn't) because everyone smoked at that time. This makes it look flawed and cool at the same time. And to younger people, the most desirable things are those things they are not supposed to do. Therefore I wonder if this is becoming sort of a backlash. 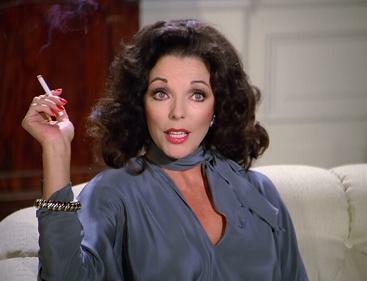 *Funny mistake: a few weeks ago I've watched an 80s period drama, set in Argentina, and the mother character tried to hide the fact that she was smoking (or smoking again). That would never have happened in South America in the early 80s. So it was funny to see how they transmitted the sentiment of our current zeitgeist to a free-to-smoke-for-all-era. Absolutely. I'm currently watching a British sitcom that ran from the early Seventies through to 2010. Cigarette smoke was part of the ambience of the early episodes - almost a character in itself. There were characters that smoked everywhere. I didn't pinpoint exactly where it vanished, but I'm into the mid-Noughties now and it's been many, many years since anyone smoked. When the smoking ban became widespread here in the mid-Noughties, I remember reading that it could be an issue for films, shows and especially plays in which characters needed to smoke, because they're in an enclosed working environment. I imagine they could apply for special permissions and whatnot, but I'm not sure exactly what happened with that in the end. I know what you're saying about smoking being rebellious. I think it's pretty much only villains and anti-heroes who are allowed to smoke now. 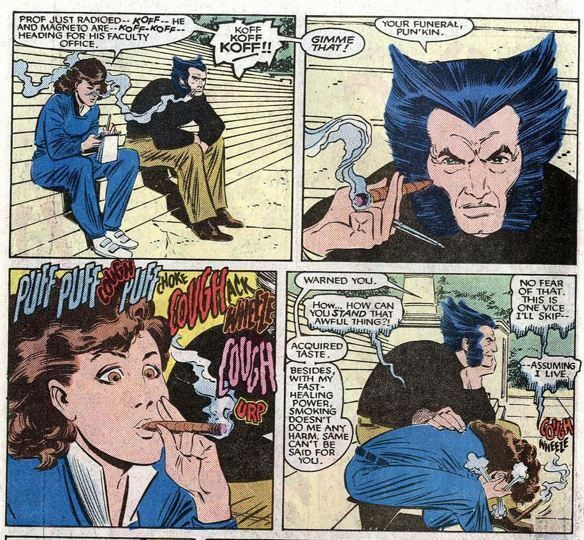 I remember reading X-Men comics in the Eighties and Wolverine was the only one who smoked. And of course he seems to be widely considered one of the coolest characters. They got away with it by saying his healing superpower made his lungs immune to the nasty effects. Well, I love all three of your examples so I'd have to agree. I find smoking in films and TV shows quite fascinating sometimes. In a "remember when we used to..." time capsule kind of way. Fur - no matter what the era and context - never fails to make me uncomfortable in a way that smoking never does. Well, as long as you have the pleasure too.